FORMULA 500s - Higgs Wins the Finale! 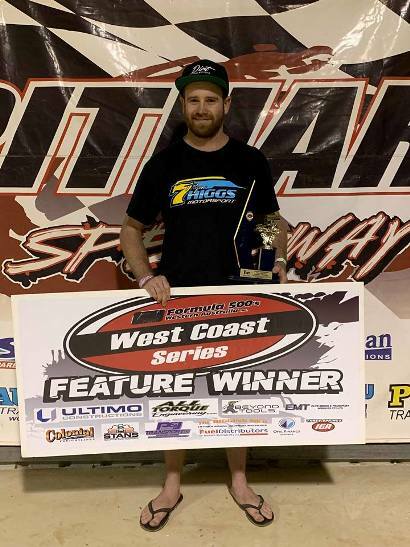 Ryan Higgs has again shown everyone he is a force to be reckoned with as he last night raced his way to victory in the final round of the Ultimo Constructions West Coast Series, lapping all but second place in a dominant drive. Being the final chance for drivers to earn points for the West Coast Series also added some excitement, not to mention a number of drivers playing their Ace Cards which would have serious ramifications for the overall Series. In the end though it was Ryan Higgs who again stood tall, starting off pole position in the feature and immediately assuming the lead as the race went green. Almost as soon as the race started though the yellows were back on, with a couple of cars coming together, and forcing a full restart. Jacob Priest would then head to the infield without completing a lap and ending his race early. Cody Turacchio’s night would also end early as he too pulled to the infield on the next start after another incident, leaving nine cars to take the green on the first lap next time around. 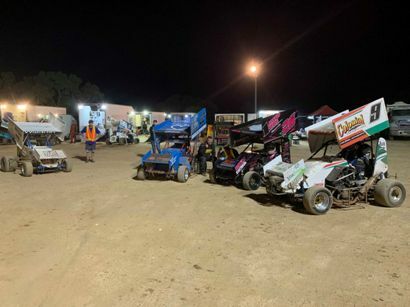 It was a case of third time lucky as the race finally got underway, with Higgs racing away from the field quickly as George Eaton settled into second place ahead of returning driver Brad Warwick who was the super sub aboard the Shane Andersson #90 machine for the night. Todd Broadwood retired from the race after two laps, but up front Higgs wound his way through traffic with ease, making passes high and low as he pulled away from the rest of the field while Eaton did well to stay in touch. Warwick maintained third until he too was forced infield on lap fourteen, seeing Higgs now leading Eaton as the only two cars on the lead lap, while Troy Samwell was now in third, albeit a lap down in what at times became a difficult race to keep track of positions. The race continued with Higgs unchallenged, crossing the line for his fourth feature win of the year and his second in the Ultimo Constructions West Coast Series for season 2018/19. Eaton held on for an impressive second place, his third podium for the year, while Samwell was officially third after the lap score sheets were reviewed, claiming his first ever podium finish in third place. Jamie Pages, Ben Stockdale, Ted Street and Chris Dymock rounded out the finishers. Courtesy of tonight’s results, and with all Ace Cards incorporated, Chris Dymock is officially the winner of the Ultimo Constructions West Coast Series on 607 points, just thirty three points ahead of second placed George Eaton who even managed to pick up his first ever heat win at the Pithara venue last night. Courtesy of his strong results at the rounds he did contest, Ryan Higgs was officially third in the series while Cody Turacchio and Edward Street rounded out the top five. Full points are down the bottom of this release. The Junior Formula 500’s were also on the program, with some great racing across the board, including a fifteen lap feature event where the Juniors really got to show their stuff. 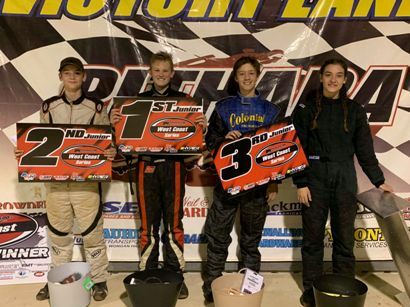 Nash Waldron and Delcan Minchin shared the heat wins, while Minchin held strong to grab the feature win and in the process and grab a $200 JP Signs voucher and a $50 Cullys Motorcycles voucher for his efforts. Waldron was second and clamed a $200 voucher from HRP Specialties while Bryce Baker was third and received $50 vouchers from RacinTyres, Cullys Motorcycles and Hyper Industries. Fourth placed Makayla Noakes also did a great job and came home fourth to receive a brand new front wing courtesy of Hyper Industries. A huge thankyou to all the sponsors who supported the Junior Formula 500’s last night and well done to all the competitors on putting on a great show. Last night’s event also brings the official WA Formula season to a close, with the annual awards night to be held in a few weeks, so stay tuned for all the information surrounding that! The 2018/19 Ultimo Constructions West Coast Series, proudly brought to you by Colonial Freightlines, Stan’s Manjimup Farm Machinery, Opal Finance, Fuel Distributors of WA, P & J Transport, Elite Mining and Transport Services, IGA Three Springs, Alltorque Engineering, The Rigging Shed, Ultimo Constructions and Beyond Tools. Pics Courtesy Formula 500’s WA Inc.
Heat One, 8 laps: 1. 3 Chris Dymock, 2. 7 Ryan Higgs, 3. 5 Cody Turacchio, 4. 65 Jamie Pages, 5. 82 Troy Samwell, 6. 81 Jacob Priest. Heat Two, 8 laps: 1. 117 George Eaton, 2. 90 Brad Warwick, 3. 17 Todd Broadwood, 4. 26 Ben Stockdale, 5. 80 Ted Street, 6. 37 Ryan Barrowcliff. Heat Three, 8 laps: 1. 7 Ryan Higgs, 2. 3 Chris Dymock, 3. 117 George Eaton, 4. 65 Jamie Pages, 5. 80 Ted Street. DNS: 37 Ryan Barrowcliff. Heat Four, 8 laps: 1. 5 Cody Turacchio, 2. 17 Todd Broadwood, 3. 26 Ben Stockdale, 4. 90 Brad Warwick, 5. 82 Troy Samwell, 6. 81 Jacob Priest. Feature, 20 laps: 1. 7 Ryan Higgs, 2. 117 George Eaton, 3. 82 Troy Samwell (19), 4. 65 Jamie Pages (19), 5. 26 Ben Stockdale (19), 6. 80 Ted Street (18), 7. 3 Chris Dymock. DNF: 90 Brad Warwick (14), 17 Todd Broadwood (2), 5 Cody Turacchio (0), 81 Jacob Priest (0). DNS: 37 Ryan Barrowcliff. Heat One, 7 laps: 1. 23 Nash Waldron, 2. 9 Bryce Baker, 3. 26 Makayla Noakes (6).DNF: 22 Declan Minchin (1). Heat Two, 6 laps: 1. 22 Declan Minchin, 2. 23 Nash Waldron, 3. 26 Makayla Noakes (5). DNS: 9 Bryce Baker. Feature, 15 laps: 1. 22 Declan Minchin, 2. 23 Nash Waldron, 3. 9 Bryce Baker, 4. 26 Makayla Noakes (13).